We first are informed about the Alternate Project Quantum Leap in the episode "Deliver Us From Evil", where Sam has for the first time leapt into the same person a second time, namely Jimmy Lomada. He has leapt here to stop whatever force is putting wrong what he originally made right on his first leap. From his first leap into Jimmy he got Jimmy accepted among the Lomada household and the community, by getting Jimmy a job at the docks, holding it down, and saving "his" nephew Corey from drowning. At the time of the second leap into Jimmy, Ziggy is going nuts trying to figure out why history is changing. Now Connie and Frankie (the happily married couple) break up, Corey runs away and is never seen again, and Jimmy gets institutionalised once more and is never again released. During a verbal argument with "Connie", Sam grabs Connie, trying to prevent her from walking away, causing the magnetic fields giving the auras of Jimmy and Connie to break, thus allowing Sam, and the other leaper, Alia, the ability to see each other for who they really are. Alia also suffers from a swiss-cheezed memory, and has a hologram named Zoe as her link to her time. The computer that gives her her assignments is named Lothos. Alia is extremely inquisitive when it came to finding out all about Sam, but was given strict orders by Zoe to tell Sam NOTHING. This is because it was ALIA who was changing history and ruining the Lomadas lives. Just as it looks like Alia has succeeded in her assignment, Lothos gives her another, to kill "the good Dr Beckett". Sam talks her out of it though, saying that evil can only exist because of good and that if she killed him she would kill herself. It is clear that Alia does not want to do the evil deeds she is being told, and that what is REALLY evil is what trapped her in time. After giving in, Alia is tortured and it looks as though she has been killed when she is illuminated with RED light and electrocuted, when in actual fact she has simply leapt out, and the alternate history she created around the Lomadas was erased. We next see Alia in "Return (of the evil leaper)" who has leapt into a young co-ed named Dawn, who is the Homecoming Queen of the University where Sam's alter-ego, Arnold Watkins "the Midnight Marauder" attends. Her assignment is not at all clear in this episode, but it seems that she has been sent to this situation to ensure that Arnold dies, who ironically has been sent to the future with Sam in his place in an attempt to save him. Alia and Zoe discover that Sam has leapt into Arnold when they see him talking to Al (who they can not see). Alia is obviously cut up about Sam being here, but tries to continue with her assignment so that she won't be tortured again if she fails. Sam eventually does find out the plot when he touches Alia and then can see her, and this time convinces her to go along with what he's been there to do and to hold on to him, because he theorises that if they are touching as one of them leaps, the other will leap with him/her. When Alia fails in her mission to kill Arnold, Zoe tells Lothos to leap her out and saying that she will kill Alia herself. However at that same moment Sam leaps also while touching Alia. They simultaneously leap into a women's prison, and it is unclear as to whether Alia had leapt with Sam, or Sam had leapt with Alia. Being tortured for allegedly murdering a fellow inmate doesn't make the answer to that question any easier. It is clear that it is Sam's leap however, when Al makes contact with Sam, and says there are two women in the Waiting Room. He says that Sam and Alia leapt there to find out who really murdered their fellow inmate, Carol Benning. To prevent Zoe and Lothos from finding Alia, Sam hypnotises Alia and makes her remember nothing but whatever pieces of her alter-ego's memory she can get hold of through mind-merging. This blocks Zoe's connection to Alia through their brainwave connection. Meanwhile, Zoe has leapt into the Warden of the prison. Why? To kill Alia for her betrayel. Unfortunately Zoe, Lothos, and her new hologram, Thames, can not trace Alia because of the hypnosis that altered her brainwaves, the fact that Zoe's brainwaves are now connected to Thames as well, and that there is no counterpart for Alia in their "Holding Chamber" (waiting room). Through conversations between Zoe and Thames, we find that it had been Lothos's plan to send Zoe as his leaper instead of Alia in the beginning. Zoe is truly evil and will stop at nothing to get her revenge. Eventually, Sam and Zoe get into a struggle and are able to see each other for who they really are. Then a game of cat and mouse ensues, and when Zoe has them cornered, she shoots at Alia. Alia leaps out just before her counterpart is shot at, and then Sam shoots Zoe before she can shoot him. Thames gets Lothos to leap Zoe out, and that is the last we see of Alia, Zoe and Thames. Because Alia's and Zoe's counterparts were unharmed when they leapt back despite being shot, it appears that if a leaper is harmed, they take their injuries with them when they leap. Alternate Project Quantum Leap was created by the Devil Himself as a means to re-make wrong what Sam had already put right, or make another mistake in time to make up for it. I also believe that Alia, Zoe and Thames are all demons sent from Hell to do the Devil's bidding - quote Zoe "We CLAWED our way out of Hell Alia to land simple assignments like home-wrecking." This also ties in with my theory that all leapers are actually DEAD, like Schtopper in Mirror Image, and as such, Sam actually died when stepping into the Quantum Leap accelerator, and since he can't be brought back to life, he can't be sent home. The reason I think that Sam went back home when he simo-leapt with Al in the Leap Back is because he actually leapt into Al. Since we never see Sam's reflection in that episode, it is quite possible that had he looked in the mirror, he would have seen Al looking back at him rather than his own reflection. But... you'll ask... how does everyone know it's Sam and not Al? Because of the letter he sent to the project. Since Lothos controls Alia's/Zoe's assignments and CAN control their leaping, I believe that Lothos is actually the devil in a different form. Does anyone know the names of the actors who played Alia, Zoe and Thames? Feel free to post your theories here. My favourite episodes are the ones with the evil leapers - it's hard to get your mind around but so much fun to watch. Well, if I post all of my theories on the evil leaper project, what would be the point of Quantum Retribution? Too much time on your hands??? I dunno lol. Remember I'm new here. Well, you just need to read that stuff... *G* You'll get it... see... you already are. I believe, as the evil leaper episodes suggest, that Alia was never truly evil and instead trapped in time by Lothos. It appears as if she was forced to become the guinea pig in an experiment in order to escape the hell that she was living in. Do I think that it literally was Hell? No. Despite Zo? 's comments in "Deliver Us From Evil," it's possible that she was calling whatever place she came from "Hell" because of being tortured. Ziggy had no records of any other time-traveler, but it seems like this is because the Evil Leaper Project was built a few years into the future, ahead of Sam's time. I do believe that Alia had survived the shotgun blast because of the bullet passing through the unoccupied space in between as she leaped out. My theory is also that Zo? did actually die from the shotgun blast and leaped out after the fact. Thames naturally lost his neural-link connection and reappeared back at the Evil Leaper Project. Note: To be shot, the evil leapers MUST be alive in the first place. (The way I see it anyway, but I'm sure that will get debated.) They were trying to kill each other which wouldn't have worked if they were dead. Also, I think Alia continued to leap aimlessly as herself, just like Sam at the end of "Mirror Image." Only from then on, she would be doing GFT's work. I wonder if both her and Sam would come in contact with each other again, with them both now on their new assignments... hmm. Zo?, Thames and Lothos were all genuinely evil, but I think Alia was always trapped working with them. Becoming a leaper herself, this only ensured her being a slave to the Project as a form of blackmail. Both a combination of being swiss-cheesed and not remembering who she used to be, and becoming numb from causing all kinds of pain in peoples' lives she touched, allowed her to do these evil deeds with more ease. It wasn't until Sam came along that she was reminded of who she really is, which caused her to crack. I agree with MOST of what you have said. But just because something is dead doesn't mean that they can't feel pain. It just means they can't die. Think about Anhelita the Angel in It's a Wonderful Leap. Sam performed CPR on an "unconscious" Anhelita after he had run her over. She felt every bash to her chest that Sam had given her and punched him in the face, then yelled at him for running her over and hitting her. I believe that Zoe DID feel the bullet and that knocked her out temporarily, and Thames had Lothos leap her out to SOME OTHER POINT IN TIME other than where she was and where she was from, because she had failed in her mission. I don't believe that it killed her because I believe she was already dead. Since the bullet had hurt Zoe, not Myers (who she had leapt into), when she leapt so did whatever had happened to her during the leap - that is why Myers seemed unharmed after Zoe leapt out and he leapt back. I agree though that the bullet meant for Alia hit the empty space during that split second that Alia leapt out and Angel leapt back, which is why Angel was unharmed. You may be asking "Then why did Zoe leap in the first place to kill Alia if Alia was already dead?" I don't believe this is the case. I believe that Zoe intended simply to find Alia, torture her while she had the chance, then leap together with Alia as Sam had done to get Alia back under Lothos' control. When Zoe said "I'll kill you myself Alia" I believe that was just a figure of speech for the pain she meant to cause Alia. Here's my theory on the identities of "The Evil Leapers". I think that the evil time travel project was set up by a rival of Sam Beckett's. This rival probably had some kind of personal grudge with Sam, and actually had an insider working at Project Quantum Leap, who stole information allowing him to build an accelerator of his own. The plan being to undo what good Sam had done, kill Sam, destroy Project Quantum Leap, and then go public and pass off the discovery of time travel as thier own. This is how I always reasoned it. I think if the show made it to Season 6, then the idea of Evil Leapers would have been explored a bit further, and a new story arc would have been set up. Sam having to battle another Evil Leaper, while back in the "present" Al would have to find out who the insider is leaking information. Not too sure about the idea of The Boogiem@n running things. I guess it makes sense, but rather than him setting it up directly, I think a more realistic expanation is that he's "influencing" somebody to set it up and run it. If you don't mind waiting an indeterminate amount of time, as I'm quite a few episodes away from there on my own TiVo....once I burn mine to DVD I can possibly/probably burn a copy for you as well. Even though it's done for entertainment, that there's a an 'evil' mirror version of Sam. It is convenient that they had a hybrid computer, a holding chamber (waiting room), an imaging chamber and of course an observer. In the "A-Z of Quantum Leap" book i'm reading, it says that the Evil Project may have been based on Sam Becket's theories. Although since it was top secret i doubt they'd be published so perhaps someone stole them and came up with the idea of doing their own project? We also know that they have more capabilities, such as Lothos controlling where the leaper goes and the timing of the leap. Exactly! So... thus began QR so one could see what goes on there. Well, it wasn't THAT top secret. Wasn't it on that TV show... Captain Galaxy? Last edited by feldon30; 06-29-2006 at 11:59 PM. Even though Zoey is reeeaaaly evil. I thought by far she was my favorite evil leaper. My favorite seen was in the first when Alia leaped in Coney and Sam (Jimmy) was trying to talk to her about how she can help her relationship with Frank blah, blah, blah...they touch...blah, blah, blah. WHAM Zoey is there checking out Sam making all these comments. I just loved that part. I have already spoke a little to Leaper1 about the Evil Leapers during the weekend. I am just about to start a story revolving around the evil leapers. Something which I think will blow the whole thing out of the water. As asearcher said to me a few weeks, everyone has one story in them dying to get out. Well... I've found mine! I predict it will take me a long time to write though. Good things always take time! Nice to see a new twist on the Evil Leaper story though and i'd read it! It's of course, entirely possible that the Evil Leaper project is in fact in the future past the Quantum Leap project. It's not hard to imagine that an oppressive regime could come to power what not only ruled over the people with an iron fist, but revamped the Quantum Leap project to make ruling over that society much easier to consolidate its power base. The reality is that with things like net censorship and sedition laws, we're on the verge of seeing just that very kind of society in the next 20 years or so, so a future portraying that isn't that far fetched. By changing lives, sam has change the world in a far future. And in the future of Lodoss team, there is too good things . So Lodoss team wants to "repair" them and puts wrongs. It is strange David Bellisario doen't make a spin-off. A kind of Quantum Leap with this Girl who leap. Last edited by Night Terror; 07-23-2009 at 08:24 PM. You mean to balance things out? No, I don't think so, they just do it for pleasure. And they don't come from a far future, either. Last edited by Night Terror; 07-24-2009 at 03:20 AM. Reason: Typo. I would've liked to see this plot line explained a bit more. I have a theory that the rival project was set up by a former colleague/friend of Sam and Al's who had actually worked with them on Project Quantum Leap - but for whatever reason they had to fire this guy. He finds out somehow that Beckett used the accelerator and what it is he is doing - so he somehow sets up the rival project under the asylum of an enemy nation to the States - and sends Alia in to find Sam, destroy him, and claim credit for the creation of the technology himself. That's a theory I could've bought. The reason he has them ruin people's lives in because he knows it will eventually cause Sam to show up - so they can assassinate him. I have a theory that the rival project was set up by a former colleague/friend of Sam and Al's who had actually worked with them on Project Quantum Leap - but for whatever reason they had to fire this guy. This is my theory, too, more or less. It makes sense that there would be other scientists who would envy Sam and try to undo him, steal his work and credit it as their own, etc. A disgruntled employee at PQL who felt passed over for a position or whatever might have turned on Sam and the project and started leaking info to a rival scientist. Whether there is anything supernatural involved, like the Devil, is a matter of interpretation - I think it can be looked at either way. Watching the second installment in the episode trilogy tonight I have a consistency concern which may just be myself misunderstanding. The evil leaper project clearly managed to surpass Project Quantum Leap in their heavy implications that they can bring Alia back after each leap and in compliment probably can target each one as well. "It was worse than death". as Sam takes Alia into his arms in his attempt to carry her with him into his next leap. Zoey sends a bullet at Alia but she is leaped out just before it hits (the host returned unharmed). This however is somewhat contradicted in Deliver Us From Evil in Zoey's attempt to egg an unsure Alia on with the gun by telling her that it could be the event that gets her home. What is "home" in comparison to her project? "Home" in reference to Sam always indicates the project or the present in which the project exists. Also I will express that I disagree with ChickenStu's theory. My theory is that the Evil Leapers as Project Quantum Leap is believed to be driven by God, is being driven by the devil. His second attempt if you will after failing to undo Sam in season 3. That the handlink left in 1945 and the tape recording of Sam under Sodium Pentothal spewing his clearance number and other crucial details of the project in 1966 were the stepping stones perhaps laid by the devil himself which provided the blueprints for Lathos. This is actually something I got from reading posts by brilliant members like yourself Chickenstu right here at Al's Place years ago. It would have been fascinating had they gone more into the backstory and working of their project as they themselves already are. These days they have actually grown on me more than all those years ago the more I put thought into them. I think it's an incongruity in the story. Deliver us from Evil seemed to be more of a "mirror" of Quantum Leap. The same basic tenets, but evil. The Return episodes really fleshed out the backstory and made it clear that the destructiveness of history is a "mission" for Lothos and their project. I don't think Quantum Leap was ever what you would call a "mission", although certainly they flitted between the morality of Sam wanting to change the world, vs. the happenstance of being a time traveler stuck in the past, all while giving him a few fleeting opportunities to fix things in his own life (and eventually Al's). Maybe that's what made Quantum Leap an enduring story -- the motivations were wide and varied. The more we heard about the Evil Leapers, the more it seemed to be deliberate ruination of lives, governments, and other organizations by some really twisted people. Don't get me wrong, I liked the concept of the Evil Leapers, probably more than most viewers, but something tells me if they had continued to go in that direction with the story, they probably would have run out of gas after another 1-2 episodes. It's too easy to turn into a pure-as-driven-snow infallible Hero vs. one-dimensional Archvillains. But don't take my word for it. 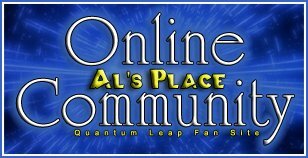 There's a whole section of Quantum Leap stories here on Al's Place both from QL's and the Evil's points of view.